I’m a tinkerer. I’ve collected some basic test equipment and tools that allow me to work on many things, mostly electronic and mechanical. 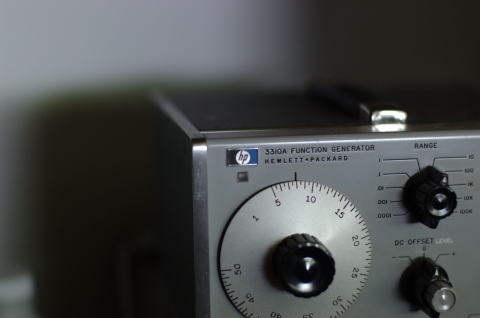 I have a cheap digital multimeter; but, the rest of my test equipment, like the HP 3310A function generator pictured above, is analog. Unlike digital equipment, where it’s no big deal to add extra digits to a read-out, analog equipment usually offers no more precision in its read-out than it’s capable of resolving. Recently, I was talking to the guy who was the grader for an RF circuits class I took a few years ago. He was telling me how amazed he was that students would calculate the required inductance for an inductor to five digits of significance. And, they would write it in scientific notation: 3.1562E-6 Henries. We laughed. Nobody can make an inductor that precisely! Yet, we can calculate (and often measure) it that precisely. Tinkering, the process of getting something working, often does not require great precision. Sometimes that’s easy to forget when you have a powerful computer and a lab full of pricey test equipment. Previous Entry: Rant: Where did the Simpsons go? Previous Entry Rant: Where did the Simpsons go?